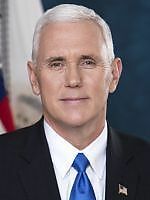 Info Congressman Mike Pence was born in Columbus, Indiana, graduated from Hanover College in 1981 and earned his Doctorate in Jurisprudence from Indiana University, School of Law in 1986. Pence was first elected to Congress in November 2000 and was reelected to the Sixth Congressional District encompassing much of Eastern Indiana in 2002. Pence serves in the House leadership as a Deputy Majority Whip and was named to chair a subcommittee during his freshman term � only the fifth freshman in the past 50 years to hold such a position. Following the September 11 terrorist attacks on New York City and Washington, D.C., Congressman Pence was appointed to the House Judiciary Committee. Pence sits on the Subcommittee on Crime, Terrorism, and Homeland Security and participated in drafting the Patriot Act and legislation creating the Department of Homeland Security. Also following the attacks, Pence traveled to Berlin as the only Member of Congress to participate in an international conference on terrorism. Pence joined His Majesty Prince Hassan of Jordan and Nobel Laureate and Member of Parliament David Trimble of Great Britain in leading panel discussions at the conference. Given his involvement in foreign affairs, Pence was named to the House Committee on International Relations for the 108th Congress. As the lone Hoosier in the majority on the House Agriculture Committee, Pence participated in drafting the 2002 Farm Bill, which included a historic increase in resources committed by the federal government to American agriculture and conservation. Congressman Pence has become a national spokesman for mainstream conservative issues. He has appeared on CNN's Crossfire, where co-host and prominent Democratic strategist James Carville has called him "very influential in the House." He has also appeared on numerous programs on the Fox News Channel. Following graduation from law school, Mike Pence first ran for Congress in 1988 and 1990. In 1991, Pence was named President of a conservative state think tank based in Fort Wayne known as the Indiana Policy Review Foundation. In 1992, Pence started a career in radio broadcasting and, two years later, Network Indiana syndicated his show statewide. The Mike Pence Show aired weekdays on 18 radio stations. Pence also hosted a Sunday morning political television show in Indianapolis from 1995 to 1999. Mike and his wife Karen have three children and reside in Columbus, Indiana. When Congress is in session, the Pence family lives in Arlington, Virginia. Congressman Pence describes himself as "a Christian, a conservative and a Republican, in that order."